CARACAS, Venezuela (AP) — Nicolas Maduro's government backtracked Saturday from its order for U.S. Embassy personnel to leave Venezuela, moving to defuse tensions with Washington just hours after international diplomats traded heated rhetoric at a special U.N. Security Council meeting on the South American country's crisis. The socialist president broke relations with the United States on Wednesday after the Trump administration and many other nations in the region recognized opposition leader Juan Guaido as Venezuela's interim president, a move that Maduro called a "vile" coup attempt. His order gave U.S. diplomats three days to leave the country, but the Trump administration said it wouldn't obey, arguing that Maduro is no longer Venezuela's legitimate president. That set the stage for a potential showdown at the hilltop U.S. Embassy compound Saturday night, when the deadline was to expire. But as the sun set on Venezuela's capital, the Foreign Ministry issued a statement saying Maduro's government was suspending the expulsion to provide a 30-day window for negotiating with the Trump administration on setting up a "U.S. interests office" in Venezuela and a similar Venezuelan office in the United States. The U.S. and Cuba had a similar arrangement for decades before the Obama administration restored diplomatic relations with the communist-run island. "That is true diplomacy," Maduro said after reading out the statement on national television. Earlier in the day, critics and supporters of Maduro's government faced off at the U.N. Security Council, reflecting the world's deep divisions over Venezuela, which is mired in political confrontation as well as an economic collapse that has caused millions to flee the country. During the debate, which was requested by the U.S., Secretary of State Mike Pompeo urged all nations to end Venezuela's "nightmare" and support Guaido. He told the council it is time to back the Venezuelan people as they try to free themselves from what he called Maduro's "illegitimate mafia state." Russian Ambassador Vassily Nebenzia charged that the Trump administration is trying "to engineer a coup" against Maduro. He said Venezuela doesn't threaten international peace and security, and he accused "extremist opponents" of Maduro's legitimate government of choosing "maximum confrontation," including the artificial creation of a parallel government. Nebenzia urged Pompeo to say whether the U.S. will use military force. Pompeo was accompanied to New York by Elliott Abrams, who was named a day earlier as the U.S. special representative for Venezuela. Abrams is a former assistant secretary of state for Latin America who worked at the White House when a 2002 coup in Venezuela briefly ousted Maduro's predecessor, the late Hugo Chavez. On his first day on the job, Abrams met with exiled leaders of Venezuela's opposition. He also spoke by phone with Guaido, the leader of Venezuela's opposition-controlled congress. Abrams reaffirmed U.S. support for Guaido as interim president, said Kimberly Breier, the current assistant secretary of state for the region. The Security Council, the U.N.'s most powerful body, has not taken action on the Venezuelan crisis because of the divisions. The Security Council's five veto-holding permanent members could not unite behind a statement on Venezuela, presenting widely differing texts. The leaders of two of those council nations — France and Britain — joined Spain and Germany to turn up the pressure on Maduro, saying Saturday that they would follow the U.S. and others in recognizing Guaido as president unless Venezuela calls a new presidential election within eight days. The European Union's foreign policy chief, Federica Mogherini, said that if there is no announcement of a new election in the next days, the 28-nation bloc "will take further actions, including on the issue of recognition of the country's leadership." Venezuelan Foreign Minister Jorge Arreaza dismissed the deadline. "Europe is giving us eight days?" he asked the council. "Where do you get that you have the power to establish a deadline or an ultimatum to a sovereign people. It's almost childlike." Arreaza said Venezuela "will not allow anyone to impose on us any decision or order" and demanded that someone show him where in Venezuela's constitution says an individual can proclaim himself president. Guaido says he is acting in accordance with two articles of the constitution that give the National Assembly president the right to hold power temporarily and call new elections. While the council debated, a man identifying himself as Venezuela's military attache in Washington posted a video saying he had broken with Maduro and now would report to Guaido. "The armed forces have a fundamental role to play in the restoration of democracy," Col. Jose Luis Silva said in the video, which he said was shot at his office in the Venezuelan Embassy in Washington, sitting in front of the nation's red, blue and yellow flag. He called on other members of the military to join him in supporting Guaido, saying they need to avoid "attacking" protesters whose only aim is to feed themselves. 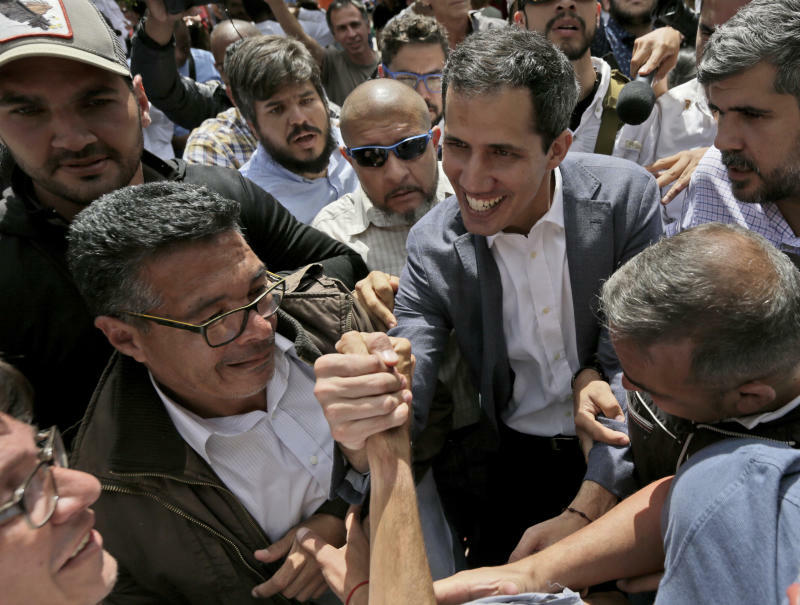 Guaido celebrated Silva's decision to defect. "We welcome him and everyone who with honesty want to follow the constitution and the will of the Venezuelan people," he said on social media after attending a small assembly in Caracas to discuss the opposition's next moves. Garrett Marquis, a spokesman for U.S. National Security Council, encouraged others to follow Silva's lead "to protect constitutional order, not to sustain dictators and repress its own people." Venezuela's top commanders have pledged loyalty to Maduro's government in the days since Guaido declared himself interim leader on grounds that Maduro's re-election last year was fraudulent — an allegation supported by the U.S., the European Union and many Latin American nations. But support for Maduro's rule is weaker among the military's rank and file, whose households are suffering from widespread food shortages and hyperinflation like their civilian counterparts. Last week, a small National Guard unit stole a stockpile of weapons in what it said was an attempt to oust Maduro. The uprising was quelled and 25 guardsmen arrested. The standoff could set the scene for more violence and has plunged troubled Venezuela into a new chapter of political turmoil that rights groups say has already left more than two dozen dead as thousands take to the street demanding Maduro step down. It also threatens to worsen the country's economic crisis, as directives sent Friday by the State Department to the Federal Reserve will make it harder for Maduro to gain access to the government's sizable overseas assets, including revenue from oil sales and profits by Houston-based Citgo, a unit of the state-owned oil giant PDVSA. Associated Press writer Manuel Rueda reported this story in Caracas and AP writer Edith M. Lederer reported from the United Nations.